George Leo "Moose" Connor (January 21, 1925 – March 31, 2003) was an American football offensive tackle/linebacker for the Chicago Bears from 1948 to 1955. He was a number one draft pick by the New York Giants in 1946. He is a member of the Pro Football Hall of Fame and of the College Football Hall of Fame. He attended both the College of the Holy Cross and the University of Notre Dame. He won the first Outland Trophy in 1946. Grantland Rice once observed Connor was "the closest thing to a Greek God since Apollo." George Connor was born in Chicago, and was not expected to survive infancy, weighing only three pounds at his premature birth. He served in the United States Navy during World War II. ↑ "Reflections of the Dome - April 2003". ↑ "George Connor, 78, Standout For Notre Dame and the Bears". The New York Times. 2 April 2003. 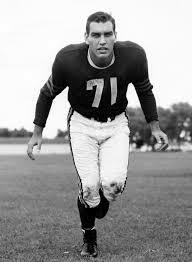 ↑ "George Connor, 78; Hall of Fame Linebacker for the Chicago Bears". latimes. ↑ "George Connor Bio :: Notre Dame Football :: UND.COM :: The Official Site of Notre Dame Athletics". ↑ "Chicago - Bears in the Hall - George Connor". ↑ "Sarasota Herald-Tribune - Google News Archive Search".